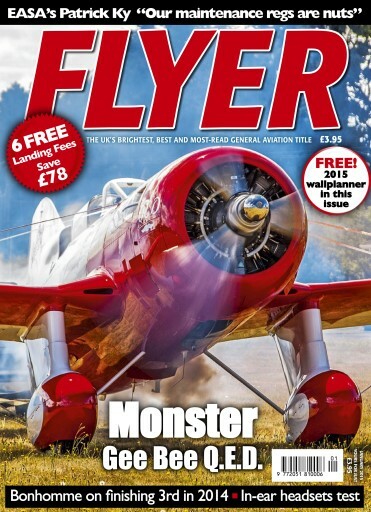 This month in FLYER, Ken Scott talks to the team that completed the late Jim Moss’s amazing recreation of the ‘giant’ Gee Bee Q.E.D., and finds out what it’s like to fly a machine that has the unusual operating restriction of unusable power! Ian Seager flies the AirCam, an usual kit-built twin-engined machine that offers unbelievable visibility and slow flight capability. Got a canine friend? Annabel Cook suggests that taking your dog on a flying adventure is easier than you think. Elsewhere in the issue, we interview the new head of EASA, Patrick Ky, Joe Fournier looks at runway incursions in Accident Analysis, and there's a test of three in-ear headsets in Top Gear. Add in a flying adventure in search of VFR flight at midnight in Sweden, the chance to save £78 in landing fees, the latest news, comments, events and much more, and you can see why FLYER is the brightest and most-read GA title in the UK.